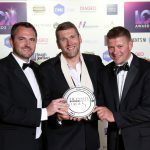 Harbour & Co., which opened less than a year ago in Donaghadee, has claimed the title of Bar of the Year at this year’s Licensed & Catering News Awards, held in the Europa Hotel, Belfast, on Friday evening, June 10. We defeated very strong competition in this popular category, which was sponsored by Tennents NI. Among those who had been vying for honours were The Albany and Brewbot in Belfast; The Central Winebar in Ballycastle and last year’s winner, Mary’s Bar in Magherafelt. The bars were independently judged by specialist mystery shopping firm, Spotcheck NI and this year, for the first time, LCN’s media partner, Q Radio, was involved in a series of live broadcasts from each of the finalist venues. And, the public had their say too, casting their votes in their hundreds via LCN’s website. The Licensed & Catering News Awards are the biggest event of their kind for local hospitality businesses. First presented in 2009, they attract a wide cross-section of the trades and offer recognition to the best hotels, bars, restaurants and guest houses across Northern Ireland.